A Trigger Point is essentially a "knot" in a muscle or fascia that is locally painful and may refer pain to a distant site. For example there are TP's in the trapezius muscle that refer pain up the posterior neck and into the head, specifically around the temple and jaw. This TP is a major cause of tension headaches. Releasing it and others around the head and neck will likely stop the occurrence of tension headaches. At Remedy Wellness Centre we use our knowledge of trigger points for both treatment and diagnosis. In many cases the source of the pain isn't where it hurts. There are many conditions that are misdiagnosed, like carpal tunnel syndrome and tennis elbow. 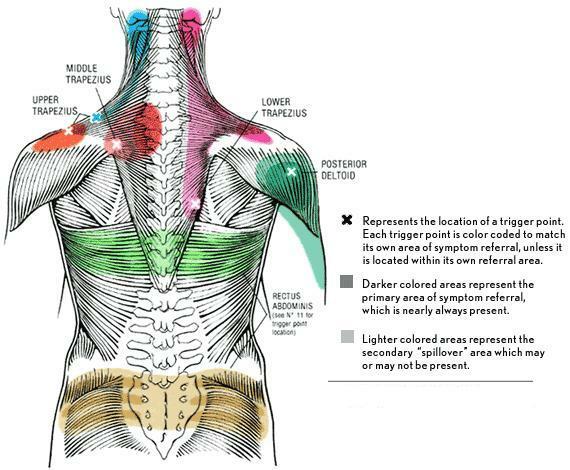 Releasing trigger points in the neck and shoulders will often relieve the patients symptoms and can prevent them from needing surgery. The trigger point is indicated with an "x" and the pain referral pattern in red. Diagram courtesy of Trigger Point Manual By Travell & Simons.